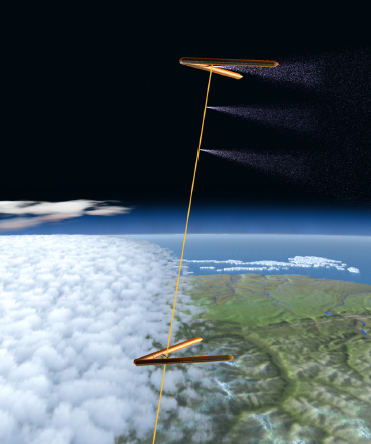 Stratospheric Dust — ‘chemotherapy’ for our planet! 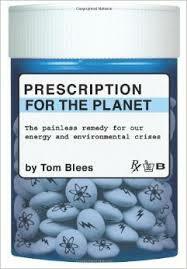 As I said on the Geo-engineering page prevention right now is far safer and cheaper than any geo-engineering ‘cure’. Preventing cancer is far better than chemo! But have we left it too late, especially as the world now discusses limiting warming to 1.5 degrees, not 2? Harvard Physics Professor David Keith says we can slow climate change by half without significant side effects by sprinkling artificial diamond dust in the upper atmosphere. This blocks out a fraction of a percent of incoming sunlight without hurting the ozone layer (as other dusts might have). But he also warns against trying to offset all our warming, as the side effects of the cure could become worse than the climate change itself. David Keith movie: 8 minutes only. One of the fastest ways to cool this planet is also the cheapest: pour millions of tons of microscopic dust into the stratosphere every year. This mimics what happens when a volcano explodes and shoots millions of tons of dust up 20 kilometres. It acts like a giant pair of sunglasses wrapped around the Earth, protecting us from a tiny amount of sunlight. The reason this is so effective is that a small amount of dust can reflect enough sunlight to prevent an enormous amount of heating. It is sometimes called Stratospheric sulfur aerosols, but this seems too prescriptive. Apparently we do not have to use sulphur, which may damage the Ozone layer. So I prefer the United Kingdom’s anagram SPICE, which stands for Stratospheric Particle Injection for Climate Engineering. Then there’s a little math. Pinotubo released 20 Tg S02. Divide by 4 years (for the maximum cooling) = 5 TG / year. Point 14 says there are more effective gases that could roughly halve the gases required, so that’s about 2.5 TG a year. That’s one Pinatubo every 4 years. But if we don’t want to mess with the climate too much, and do slightly less cooling at one Pinatubo every 8 years, we can halve that and round it down to around 1 TG / year. This is exactly what the graph then costs. It’s all guesstimates of the cost, so if you want one Pinatubo every 4 years, just double the cost again. Table 2 summarises the purchase price of 13 KC-10’s as just over a billion, and then the whole program only costs $225 million per year to run! That’s a tiny fraction of fossil fuel profits, which is why this program is seductively cheap. Professor Paul Crutzen, winner of the 1995 Nobel Prize for his work on the Antarctic ozone hole, has proposed an emergency geoengineering solution to cool off the planet: dump huge quantities of sulfur particles into the stratosphere to reflect sunlight. His paper, “Albedo Enhancement by Stratospheric Sulfur Injections: A Contribution to Resolve a Policy Dilemma?” was published in the August 2006 issue of the journal Climatic Change. 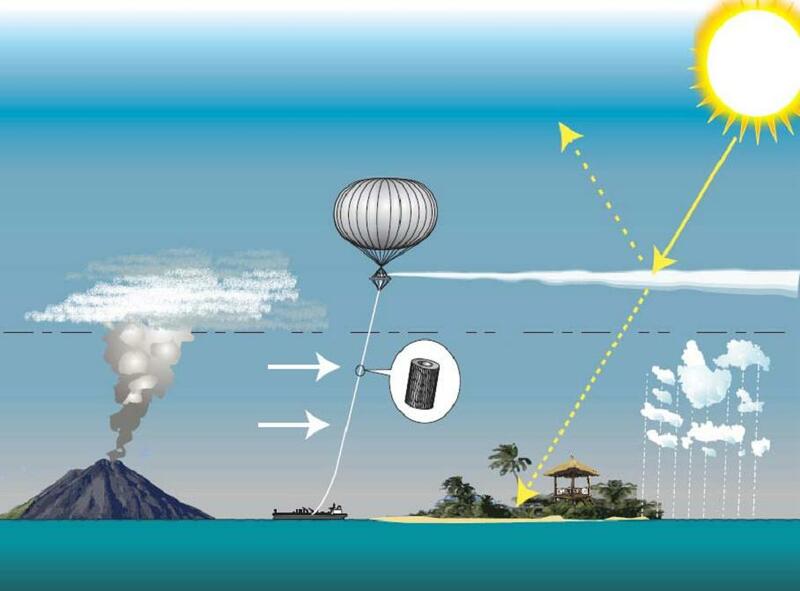 A recent editorial in the New York Times by Ken Caldeira called for more research into geoengineering schemes like this to cool the planet, proposing that 1% of the $3 billion federal Climate Change Technology Program should be spent thusly. (I think the Ozone concerns are only relevant if one uses sulphur, and ceramic dust substitutes can be used instead). There are other studies that are trying to measure just how bad the Ozone damage would be. It’s important to keep asking this question and studying this effect, as this field seems in its infancy. Unilateral action: There are other concerns about the delicate political challenges involved in this global planetary engineering solution. The first being that we do not yet have a global government. Who decides when to use this? What if America wakes up one day and finally realises that, gosh darn it, global warming was real after all. What if they cannot tolerate their bread basket drying up and oceans swamping their cities? SPICE is frighteningly cheap. It would only take a small percentage of their military budget to fly a SPICE program. They might be saddened by India’s monsoon failing: but American jobs and farming and food security would be more important! (To them at least!) The unilateral potential of SPICE is quite dangerous, and could lead to conflicts. Postponing carbon reductions: SPICE might indeed be too cheap. Some nations might see SPICE alone as the answer. But SPICE does not stop coal power killing tens of thousands of people a year, or guarantee energy security, or provide clean electric transport, or create beautiful walk-able cities, or fix our acidic oceans. Only a nuclear electric transport grid running New Urbanist eco-cities can scale back fossil fuels, fix our cities, clean our oceans, and give us long term sustainability. How would they shoot SPICE up there? However, an assessment reported in Newscientist suggests it would be cheap relative to cutting emissions. According to Paul Crutzen annual cost of enough stratospheric sulfur injections to counteract effects of doubling CO2 concentrations would be $25–50 billion a year. This is over 100 times cheaper than producing the same temperature change by reducing CO2 emissions. That sounds expensive, and I would much rather put $50 billion a year into GenIV nukes coming off the assembly line! However, we may soon need to do both. There are also a variety of new technologies being studied to make this even cheaper. The UK SPICE project plans to use a series of hoses attached to permanently floating weather balloons to just pump the solution up. Dr Hugh Hunt from the University of Cambridge confesses that none of his engineering colleagues on the SPICE project actually want to see their project used: they also find SPICE as appealing as chemotherapy. So while existing military jets are a way to fly the dust up, Dr Hunt’s team continue to work on developing much, much cheaper methods of simply pumping the dust up. Speaking to the ABC’s Big Ideas, he outlines that to do this requires a number of technologies that simply do not exist yet. The goal is the cheapest way to get 300 kilograms of microscopic solution up per second. a hose that can survive maybe 4000 or 5000 atmospheres of pressure! Mining technology works at about 200 or 300 atmospheres. A balloon about the size of the MCG, including the car-parks around it. Create a pipe that is aerodynamic to reduce the drag on the balloon and therefore the size of the balloon. Create this pipe in one length 20km long to increase strength and eliminated the ‘weakest link’. If pumped at about the same volume as a car petrol pump which is about a kilogram per second, we would only need 300 SPICE balloons worldwide to do the job. Apparently we now have the technology to build a carbon-epoxy tower around 114 kilometres high! 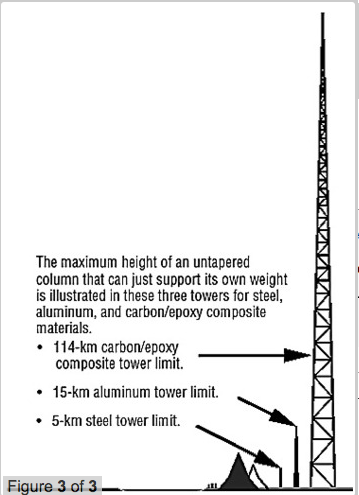 We “only” need a tower 20km high to pump SPICE up, but as no-one has built a 20 kilometre high carbon-epoxy tower before the authors of this study were reluctant to cost it. I hope we don’t have to use it, as the state of the planet would have to be absolutely unthinkably horrible to risk shutting down the monsoon and hurting the Ozone layer and blanching our skies white. Let’s hope and pray we don’t have to go there. I want to be wrong on this one. I have heard that, should we employ albedo modification/SRM, then we could never stop it, as the planet would heat up dramatically once we did. Is this true? Could we slowly taper off of SPICE after, or as we, eliminate CO2 emissions? “Never” is a long time. 🙂 We shouldn’t really stop the Sulfur Shield / ‘White Skies’ until CO2 stabilised at some PPM measurement that they desired. The climate may *already* be terribly destabilised and require ‘White Skies’ until we can store enough carbon in biochar etc to bring it back down to 350ppm. The political problem? This is so cheap that it could be funded by wealthy *individuals*, let alone fossil fuel dependent nations like America that might make yet more unilateral decisions on behalf of the rest of the globe. I would prefer a world panel of scientists in control of this: but it’s too cheap for that.